Please type your name and email below. The lecturers of the Academy of Chromatography have many years of experience, both from academia and the industry. Dr. Jan Ståhlberg to the left in the picture above and Dr. Per Lövkvist to the right. 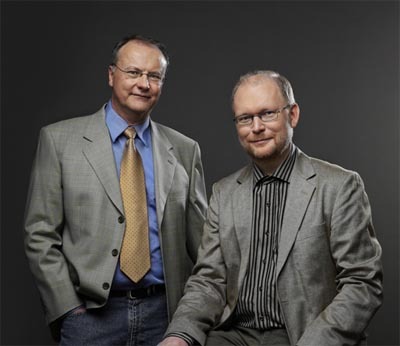 Jan is Associate Professor in Physical Chemistry at Uppsala University. His research has mainly dealt with retention theories for ionic species, both small ions and macromolecules. Ionic compounds often exhibit peculiar peak shapes in Capillary Electro-Chromatography and Jan has proposed a mechanism for this behaviour. "Liquid chromatography is a multidisciplinary field with many theoretically interesting aspects which have strong practical implications. I have always been interested in theoretical problems with practical importance. Today, with the development of computers and software, it is possible to illustrate theoretical issues in a pedagogic way without mathematics.."
Jan has been working as analytical chemist in the industry for more than thirty years. Since 1980 he has been working at the QA&QC department in the pharmaceutical industry at different managerial positions and as Senior Scientific Adviser. "More than thirty years of experience of developing analytical laboratories in the industry have taught me that professionalism at all levels in an organisation, is important for its performance. A good understanding of what you are working with is vital for all who want to be productive and do a solid work. Furthermore, the work is much more fun when you really understand what you are doing. This insight is the motto for my work in The Academy of Chromatography." Per has a PhD in Analytical Chemistry from Lund University, Sweden. The last 13 years he has worked in the pharmaceutical industry, both in research and in production. Per’s academic research mainly concerned sampling and sample preparation methods for trace analysis of amines, both from a theoretical and a practical point of view. Sven is honorary professor at Stockholm University. He was adjunct professor at Stockholm University during the years 1999 to 2006. His main research interests currently are analytical applications of NMR and LC/MS, together with development of methodology for analysis and information extraction of large data sets. He has more than 80 publications in international peer reviewed journals. Sven has been leading and responsible for analytical science departments for more than 20 years at Kabi, Pharmacia and AstraZeneca. Departments that dealt both with synthetic as well as biopharmaceuticals from discovery phase to products on the market. Sven is currently visiting professor at Stockholm University, and owner/part owner of Jacobsson Analytics & Consulting AB, BioPharmaLinx AB and ClinStorage AB.